Sawyer Mill Blue Windmill Pillow 18 x 18"
Add a touch of vintage charm to your modern farmhouse or country style home with the Sawyer Mill Blue Windmill Pillow. Featuring a distressed white windmill surrounded by "Sawyer Mill Farms" writing in white on a denim blue chambray. 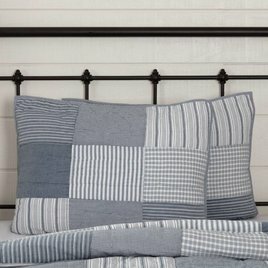 The Sawyer Mill Blue Barn Pillow features a stenciled barn with silo in distressed color.. Pillow reads "Sawyer Mill Farms Since 1928" & reverses to textured chambray fabric with 2 white button closures to complete the look. 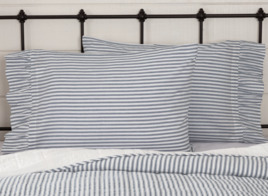 The Sawyer Mill Blue Flag Pillow freshens up your farmhouse style! 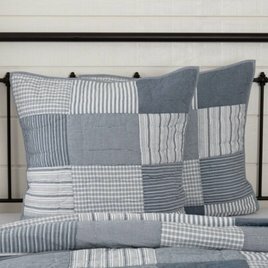 Featuring contrasting rows of the popular grain sack stripes with a windmill in the corner in distressed soft white on denim blue chambray. A mixture of distressed white and blue! 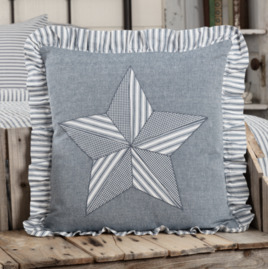 The Sawyer Mill Blue Barn Star Pillow features a barn star with ticking stripe & check design in soft white on denim blue chambray. Finished with a ticking stripe ruffle around the edge to add a touch of romance to the home-spun like fabric.